bebop spoken here: CD Review: Filipe Monteiro - In Bad Company. 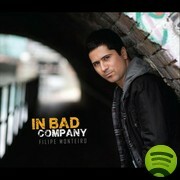 CD Review: Filipe Monteiro - In Bad Company. Filipe Monteiro (gtr); Roberto Manzin (ten/sax/clt); Sam Leak (pno); Fergus Ireland (bs); Callum Armstrong (bagpipes); Lewis Wright (dms). Let me make this clear - this disc has nothing to do with the rock band Bad Company! It's far too good for that. However, I could see the name being a deterrent to the right customer and an attraction to the wrong one! The CD is Monteiro's first album and it is an impressive début. Drawing on his memories of living in a small village nestled in the Italian Alps, moving around Europe and Canada, settling in London in 2005 and, of course, his affinity with Brazil. The all but one self-penned compositions create an aura of beauty that reflects in the music. The inclusion of bagpipes may cause a few quizzical eyebrows to be raised but the pipes are not intrusive and contribute greatly to the one track where they are featured. As well as his compositional skills, Monteiro is no mean guitar player, displaying a wealth of ideas in solos that abound in lyricism. Leak, in fact, is a tower of strength throughout and bass and drums gel helping to make this an album to delve into time and time again. Filipe Monteiro: In Bad Company was released earlier this year. To obtain a copy check here. A Special week next week Not to be missed! CD Review: Swing from Paris - Quasimodo. Go Spot a Kite with the VCJ. CD Review: Nina Simone Collector Edition. Darlington New Orleans Jazz Club - Latest. "Sticks" Albright to gig at Monk Institute. Lindsay Hannon @ The Sage, Gateshead. NYJO @ THE PROMS Tonight. CD Review: The Dominic J. Marshall Trio - Icaros. A Great Day in Harlem - 54 year old today. Lemon Tops @ The Sage. On a Little Street in Singapore. Bebop Spoken There - Over 100 Quotes.